For film director Vincent Ward, the locations were key to the look of his historic feature film River Queen. 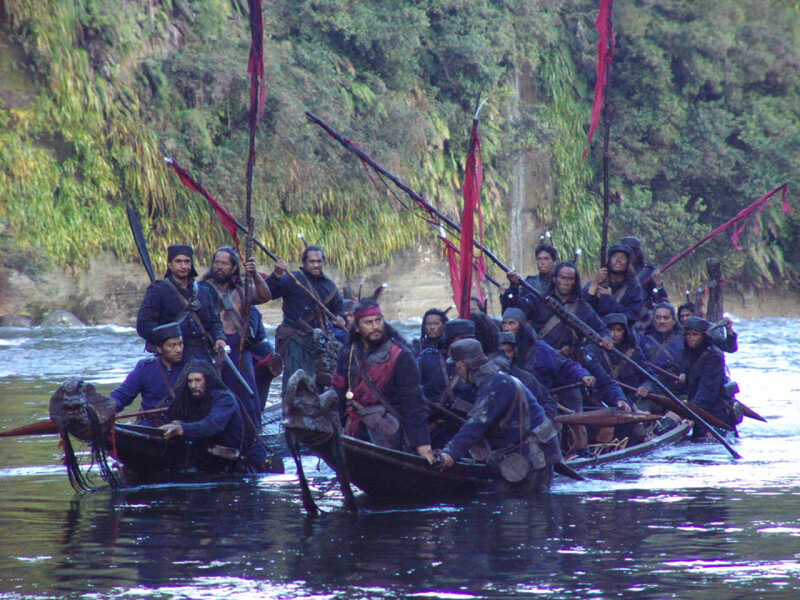 This meant "travelling a crew up rivers close to some of the actual sites where some of the last warrior chiefs had once reigned, to where first growth native bush still existed with all the primeval majesty of ancient forest" (Source: "River Queen - The making of the film on the Whanganui River"). The construction of the outpost on a remote river bank involved transporting all the material and personnel either by jetboat or by helicopter. Eight jetboats and drivers were hired for this massive undertaking. Water safety was another crucial issue, given that filming took place in winter (from June to August 2004). Cast and crew working in the water had to wear wet or dry suits under their costumes and once finished, were put into a hot tub that had to be helicoptered in to the location. The set itself included a couple of huts, a watchtower and a few additional props. 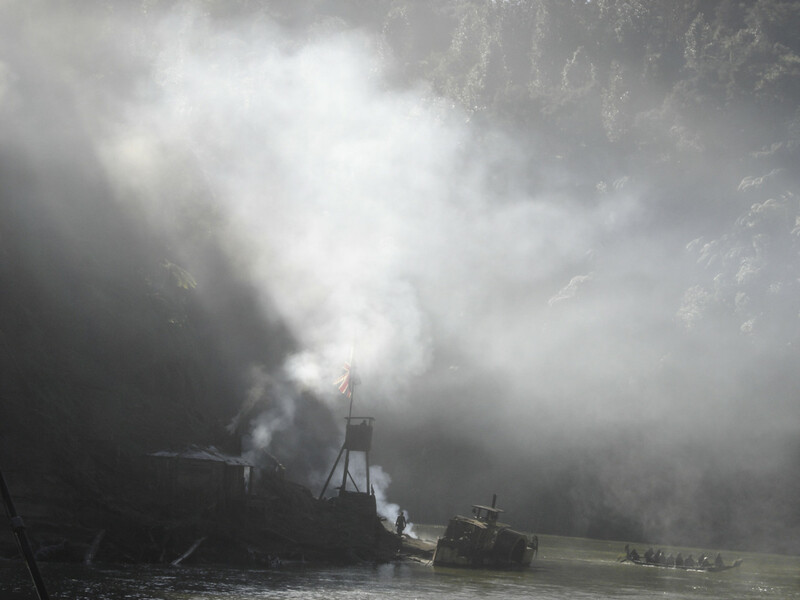 The location features in the opening scenes and later on, when the outpost is attacked by the warriors of chief Old Rangi. As a visitor, you have two means of accessing this remote stretch of the river: paddling down from further north or jetboating up from Pipiriki or even further south. Three jetboat companies operate in this area and you can be sure that they will look after you. As an added bonus, these three companies transported the movie's cast and crew, and chances are that your driver will be able to tell you some film-related stories. From Pipiriki, it takes roughly twenty minutes to reach the film location which will be on your right. When you book a jetboat trip heading north from Pipiriki, your experience will most likely also include a visit to the Bridge to Nowhere, which involves a 45-minute (one way) walk through native bush. Originally built as a wooden swing bridge in 1919, the idea was to provide farmers in some of the isolated valleys with better access to the riverboats travelling up and down the Whanganui In 1936, a more solid concrete bridge was opened, including plans to build a road. The hope was to attract more settlers to this remote area, but this idea remained just a dream. By 1944, the last of the farmers had left and the road never came to fruition. The small settlement of Pipiriki is the starting point for the standard jetboat tours that go upriver to the Bridge to Nowhere (and past the filming location). Instead of taking the jetboat for the return trip down to Pipiriki, why not get active and grab a paddle? Let the jetboat operators know at the time of booking and they will bring the canoes. The river is very gentle for beginners and most of the rapids are rather harmless.